Earlier today, Family Mart made a sudden announcement, that is a collaboration between Family Mart and Hatsune Miku. The said event is named 'Happy Kuji' (Kuji means lottery in Japanese) Happy Kuji is a lottery where you play a lottery to win various of your favourite character goods. The event will start in the midst of August 2012! Read on for more info! The Happy Kuji costs 800¥ per round. There are 9 types of prizes to be won and currently only two prizes are announced. Hatsune Miku Family Mart ver. 1/8 scaled figure. 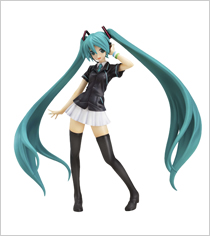 A Hatsune Miku figure clad in Family Mart uniform produced by Good Smile Company. 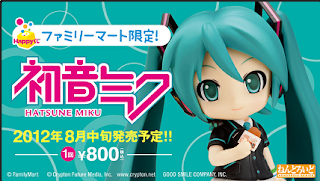 Hatsune Miku Family Mart ver. Nendroid. 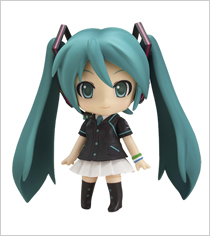 A nendroid version of the figure, also clad in Family Mart uniform and produced by Good Smile Company. There are other prizes such as clear file sets, KEI's original 3D posters and many more but there are currently no images for it though, more info will be released soon. There will be a special broadcast on NND to announce this event tomorrow. It'll be aired on the 25th of May and starts at 20:00 hours Japan time, 19:00 hours Malaysian time. There might be special guests appearing in this broadcast.